Gold edged higher to 1025.8 last week but lost upside momentum ahead of 1033.9 key resistances. 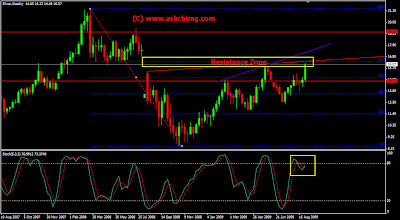 With bearish divergence conditions in 4 hours MACD and RSI, a short term top might be in place. Initial bias is neutral this week and we'd expect some pull back towards 983.2 support. Nevertheless, downside should be contained by 61.8% retracement of 931.3 to 1025.8 at 967.4 and bring rally resumption. On the upside, while another rise might be seen, it now looks like 1033.9 key resistances will hold on first attempt and bring consolidations first. Looking carefully at last week move which is first caution Sign for Bulls the weekly closing candle is DOJI clearly indicating a Indecisive Move Ahead. On the daily charts it has formed bearish engulfing pattern. The Continuous chart of 4 hours showing a Clear Candlestick bearish reversal pattern with a Shooting Star at the top. Looking at all the above condition and lead indicators which are widely the Next week Could Move in consolidation and Breach of previous week Low would Clearly Signal A Short term top in place. While some pull back might be seen in near term before decisive break of 1033.9, downside should be contained well above 931.3 support and bring rally resumption. However, note that a break of 931.3 dampen the bullish view and suggest that rise from 681 has completed. This will indicate indicate that such rise is merely part of the consolidation pattern that started at 1033.9.